Our Wentzville MO orthodontist understands the commitment that comes with wearing braces, and that is why our team at Borello Orthodontics wants to make sure you protect your progress! If you play contact sports or participate in activities where your mouth could be in jeopardy, our 5-star orthodontist highly recommends wearing a properly suited, custom-made mouthguard for braces. 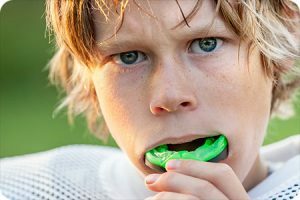 Be sure to also consult with your team, league, or coach about which types of mouthguards are best suited for your sport. Many sports find that a mouthguard for the top teeth is sufficient, but other sports, like wrestling, require a double mouthguard for both top and bottom coverage. Knowing your needs before talking to your Wentzville orthodontist will help accelerate the decision about which option is best for you. The best mouthguards for braces are fit to match your unique mouth specifically. Ask your orthodontist in Wentzville MO about having a custom-made mouthguard produced for you. Custom-made mouthguards can be more expensive than over-the-counter ones, but it will be much more expensive if you have to repair broken braces due to an ill-fitting mouthguard. A custom mouthguard from your Wentzville orthodontist will provide the most reliable protection, since the material will not harm your braces, and the mouthguard will stay in place without falling in the middle of an activity. If you are interested in what mouthguard option is best for you call your Wentzville MO office to schedule a consultation!